I have really fond memories of playing board games with my family as a child. Trouble and Guess Who were a couple of my favorites. Candy Land was probably the first board game I ever learned, and was one of the first I ever bought for my kids. And who hasn’t racked their brains trying to solve a Rubik’s cube? Today these games and many other timeless classics are made by Winning Moves. Winning Moves began operation in 1995 after being founded by four leading game industry professionals. They developed a close relationship with Hasbro Inc. (owner of Parker Brother’s and Milton Bradley) and strive to offer a full range of games for friends and family to enjoy together. 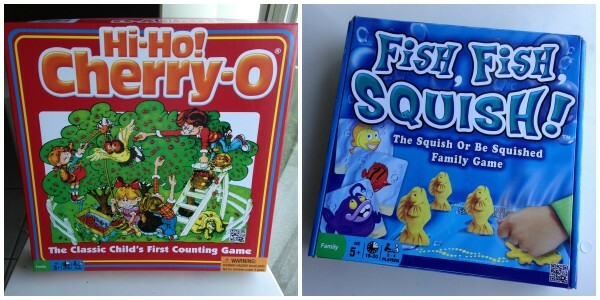 I received Fish Fish Squish™ and Hi-Ho! Cherry-O® to review. 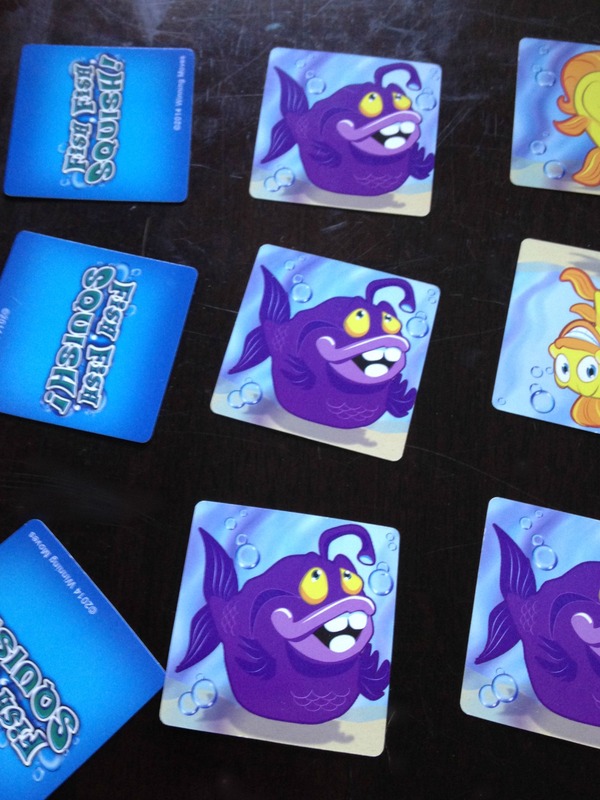 In order to earn a “squish”, a player must get 3 in-a-row with the fish playing cards. Once they have done so, they can then pick which one of their opponent’s fish they want to squish. Whoever has the most fish remaining after all the playing cards are flipped is the winner. 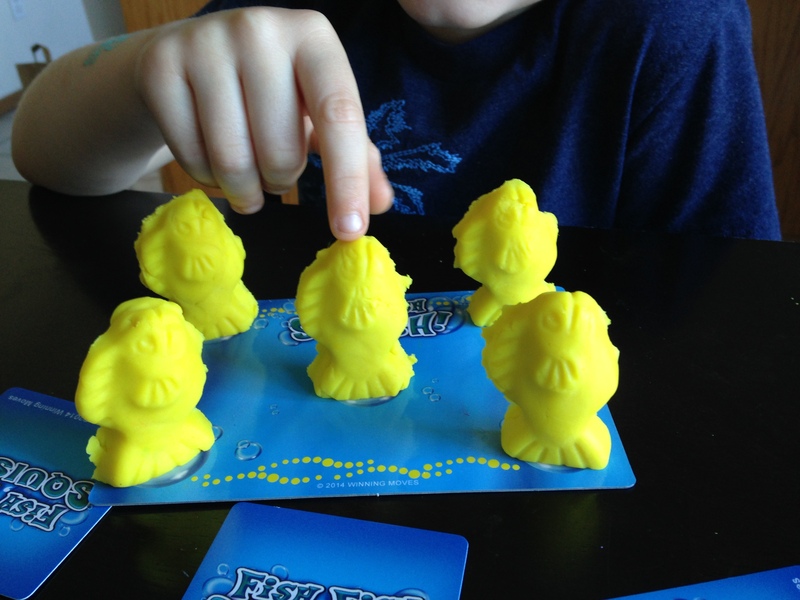 After explaining the instructions to my kids ages 5 and almost 4, we proceeded to get our fish molded with the dough and get the fish cards laid out according to the instructions. The game itself was easy enough for my daughter to play even though she falls below the recommended ages. She just needed a little help getting her fish molded and set up on her tray. Set up was a little longer than some other games we own in order to get the fish molded but the kids thought that part was just as fun as the game. There was a lot of suspense as we waited to see who would get their fish squished, and a lot of happy squeals as each player either got to do the squishing or covered their eyes to avoid seeing their fish get flattened. Clean up is a pretty easy, and each set of dough can be stored back in its re-sealable bag. Next we tried our luck at Hi-Ho! Cherry-O®. 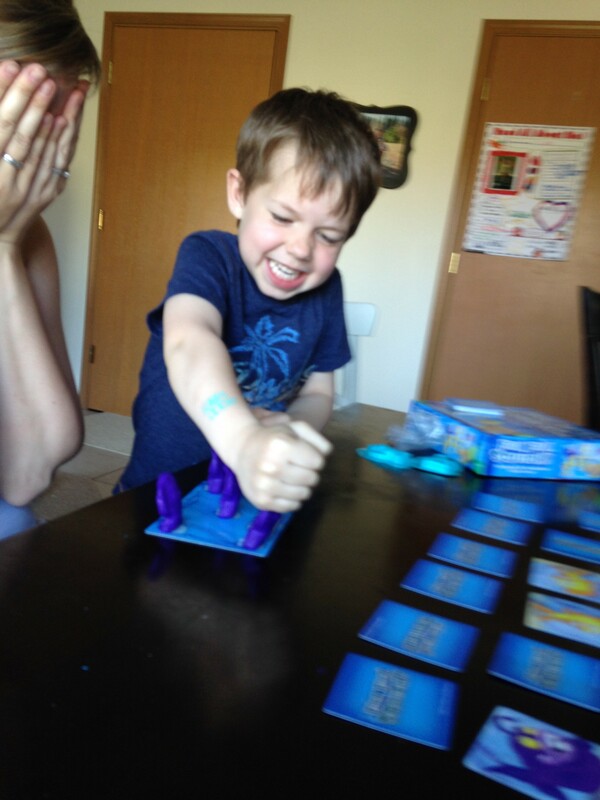 This game is suggested for ages 3 and up, and can be played with 2-4 players as well. 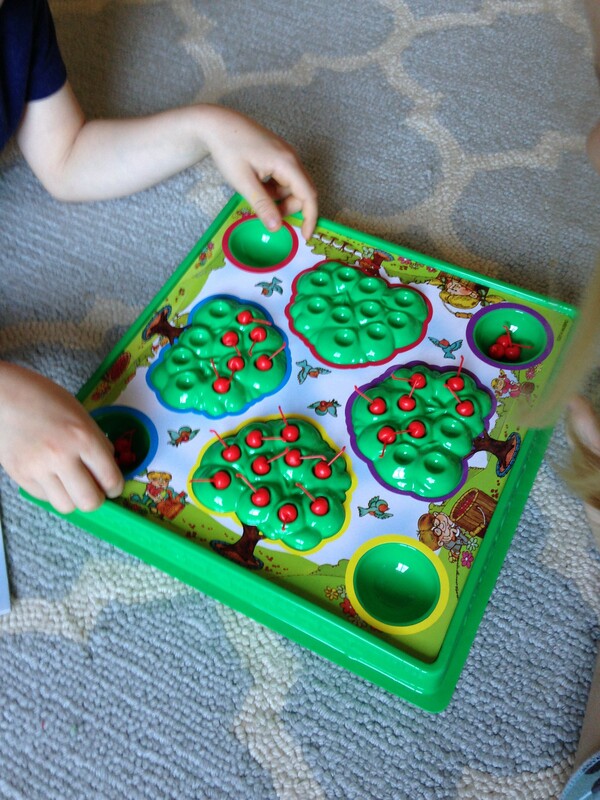 This classic game helps children develop their counting skills by adding and subtracting cherries from their trees and buckets. If another parent asked me to recommend a counting game for young children, this would be it. There isn’t anything fancy about this classic game, but anything can happen with those tiny cherries. Each player takes a turn to see who can get their cherries off their tree first. They must add or subtract the number of cherries the game spinner lands on. 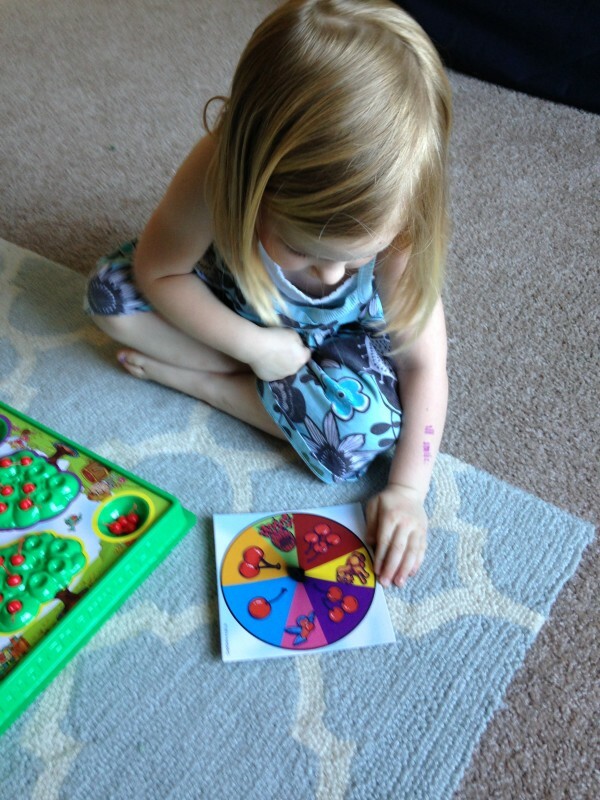 The game is easy enough for little ones just starting to develop their math skills. It’s also a fun way for kids a little older to practice their basic addition and subtraction. My kids like this one a lot as well, and it’s a good game to set up and just sprawl out on the floor and play. It doesn’t get as rowdy as Fish Fish Squish™, but some afternoons that’s just fine with me. Our whole family can sit and enjoy these game for a fun and low-cost family night or the kids can play a couple of rounds together on their own. There is a wide selection of classic and top-selling games for children and families on the Winning Moves website. The Winning Moves website has something for anyone to have a good time, and is organized by type of game or you can use their search box to find something specific. If board games aren’t your thing, be sure to check out their selection of Pastime Puzzles, or Card Games. Lose a game piece or instruction sheet to your favorite Winning Moves game? They’ve got that covered on their website too! Fish Fish Squish™ can be purchased for $13.95, and Hi-Ho! Cherry-O® for $16.95 either on the Winning Moves website or you can search for retailers near you using the link they provide. Enter below for a chance to win Fish! Fish! Squish plus YOUR CHOICE of another game from Winning Moves. Giveaway is open to US residents and ends on May 19th. I like the Crocodile Dentist® game, too! I love Candyland, Classic Trouble, and Crocodile Dentist! I love yahtzee,Trouble,Boggle,Crocodile Dentist,and Candyland,oh and of course Monopoly! I would also like the Candy Land game. I would love the Classic Sorry! I also like Yahtzee, Monopoly, Parcheesi, and the Tile Lock Scrabble. I like the game Classic Trouble. I like to play the Monopoly game & would like to try the Crocodile Dentist game. They ALL look like FUN!! Candy Land, Crocodile Dentist, Guess Who… So many good ones!